People have been making a rave over the hit series Star Wars for many years. With the release of some of the new movies, it is making even bigger waves at the box office than ever before. It is a pop culture insignia that will surely stand the test of time. So, the only fitting thing to do is to bring the iconic figures and ships to life through Lego sets. Lego was founded long before Star Wars, but bringing the two together is magical. 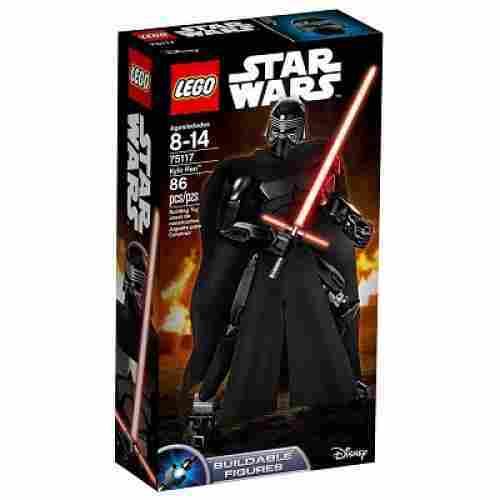 There are countless amounts of Lego Star Wars sets on the market. So we have narrowed it down to the best. 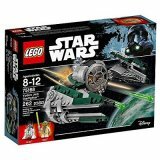 Below are the Best Lego Star Wars Sets. 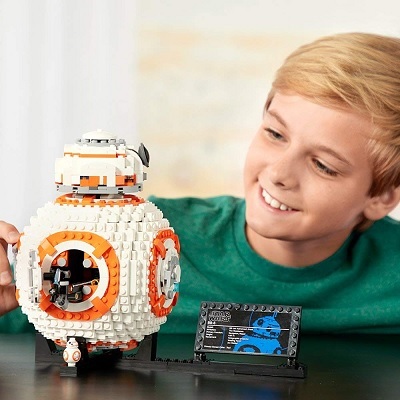 A long time ago, in a galaxy far, far away...some of the coolest LEGO sets ever spun into your child's orbit! We hope you enjoy comparing the very best of these fine toys in our new and updated format, complete with a numerical rating system and clearly-defined criteria for how to evaluate what's best for your family. 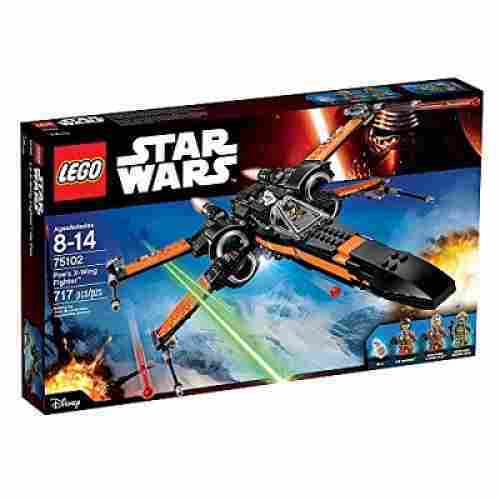 There is nothing more classic than a LEGO building set and combined with the enduring popularity of the Star Wars movie series, these 15 top sets are sure to be one of your child's favorites. A number of new sets have been added to this list and all of the product details, specifications, age ranges, sizes, cost and availability of been reviewed and verified. We love anything that features the tiny, wise man we call Yoda. 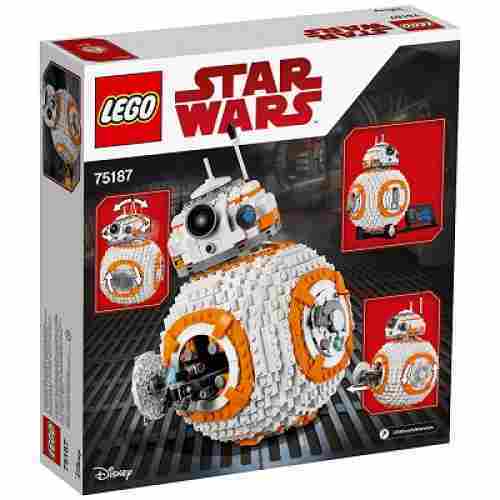 Kids do too since he’s one of the most iconic Star Wars characters from the movies which makes this kit perfect for kids aged eight and up who are true fans. Everyone loves Yoda, that’s just a fact! Now your child can have a tiny version of Yoda right in their own hands along with his legend of a spaceship, the Starfighter. Your child will love fitting Yoda in this stunning LEGO recreation of his famous ship and be zipping around the house at light speed. Yoda is sporting his very own lightsaber as well as a friend who’s along for the ride -- R2D2! They’re both average LEGO size to fit any Star Wars set and are compatible with other kits. The Starfighter has laser cannons in addition to spring-loaded shooters and you’ll find extra ammunition included in this kit as well. 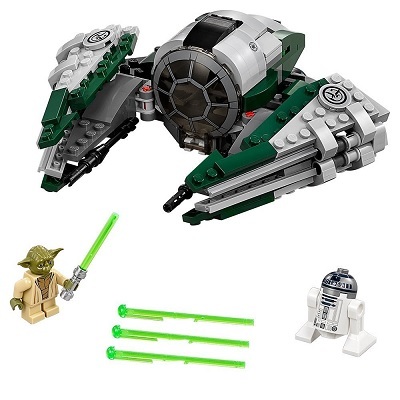 The wings of this ship fold up and down for take-off and landing and the cockpit opens easily to fit both Yoda and R2D2 as they take to the skies to fight all the enemies of the Empire. 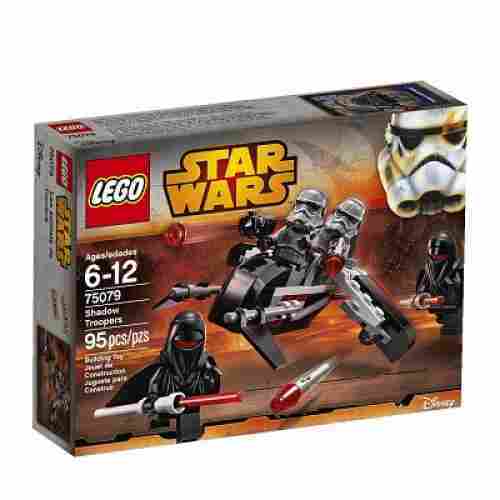 This LEGO kit features two characters who are well-loved from the Star Wars movies but aren’t necessarily seen very often as far as toys go because they’re not super active fighters like Han Solo or Anakin Skywalker. It makes for the perfect addition to an existing set because it only comes with two figurines and a rather simple spaceship. The two characters included with this star shop really steal the show. They are detailed and super fun to have in the collection. The spring action shooting cannons are a fun interactive feature for the kids to play with after it has all been put together. This prepares the starship for battle and for the ultimate action toy that every kid is looking for. They can open the top of the starship and load in Yoda and then place R2-D2 in the place in the rear and off to the stars they go. The start ship completely assembled measures in at 2 inches high, 5 inches long, and over 7 inches wide. This over the top star space with moving parts, shooting power, and laser cannoned is great for kids that are ages 8 years old to 12 years old. 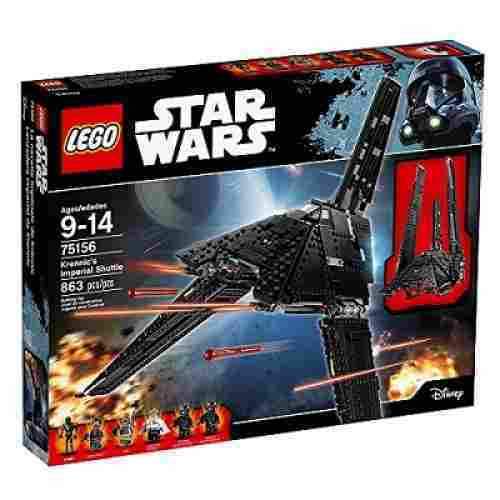 Featuring one of the most iconic spaceships of all time this Lego set includes all the pieces to create a Starfighter ship that any Star Wars or Lego admirer would love. The starship features wings that fold, a mini cockpit that opens and closes on the top, a place for RD-D2 to sit in the back, along with two cannons that are laser operated and a shooter that is spring loaded. You will also find that the set has featured two characters from the movie series. Both Yoda and an R2-D2 figure are included. There is a lightsaber for Yoda and extra ammo for the shooter. Legos are a creative way to really get kids using their fine motor skills. As they grow older the development of their motor skills should really be fine-tuned with money different activities. These small pieced Legos are great for really building on that skill set. It is all in the details with this piece. From the moving head to the stand with the decorative plague Lego has gone the extra mile with this piece. Big build, big results. With over 1100 pieces this Lego Star Wars set is amazing. 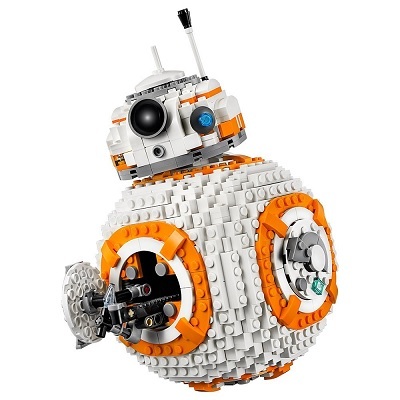 It features one of the most detailed models of BB-8 that Lego has ever done. It has a wheel activated head that rotates, a hatch that opens and closes, plus a welding torch that is non-functioning, but a great touch to the model. Included with the set is a display stand and then there is also a plaque that is very decorative and includes facts about the character. An added little touch that really adds to the display aspect of this set is the mini BB-8 figure that has been including. The mini version is just like the big one, but small. The model is not able to actually roll on its own but makes a great display piece. It measures in at 9 inches tall and 5 inches wide. The display stand measures in at over 10 inches long. 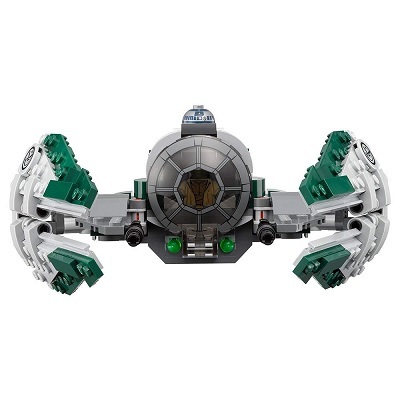 This big build results in one of the most impressive models that Lego has created in the Star Wars series and makes a great display piece for any bedroom, library, or office. Lego sets are being more and more detailed as the brand develops over of the years. The details of this model of BB-8 are great. It is able to keep builders engaged for hours putting it together as they are creatively using their minds to construct. The details and the creativity put into this model are really well done. 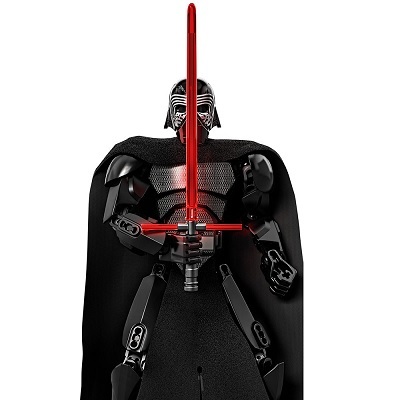 For the Star Wars fan in your life, this buildable, playable, and poseable action figure is like two toys in one! Episode 7, The Force Awakens: This movie brought the Star Wars franchise and its expansive universe to a whole new generation while also exciting fans of the original series both young and old. 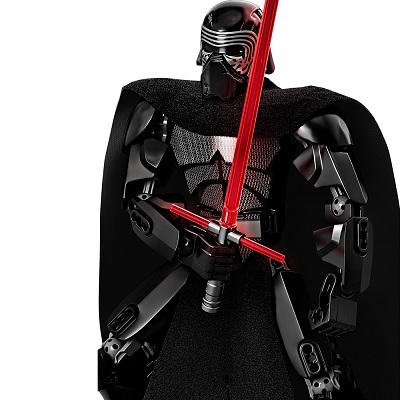 Bring home the action of The Force Awakens with the Lego Star Wars Kylo Ren. This action figure is entirely buildable. More than 80 pieces combine to form the terrifying visage of the science fiction’s newest villain. Intricate details such as the real cloth cape and lightsaber make this more than just a LEGO figure and helps bring the fantasy of Star Wars to life! 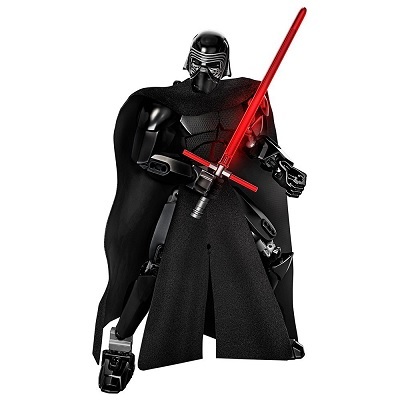 Poseable and highly articulated, your child can recreate all of their favorite scenes from the epic new movie as Kylo Ren shifts into battle poses and even swings his lightsaber! Building blocks such as LEGO provide opportunities to encourage grip strength and hand-eye coordination. The challenge of building an individual figure develops critical thinking and problem-solving skills. Completing such a complex puzzle is also great for improving your child’s self-esteem and can be useful in pretend play to stimulate creativity and imagination. It’s fun to play the hero but sometimes it's even more fun to play the villain and explore the Dark Side of the Force! With the Death Star plans well underway, the man who is in line to become its very first commander is Orson Callan Krennic. The Director of the Advanced Weapons Research division of the Empire, Krennic is an intimidating villain with an even more terrifying ship. 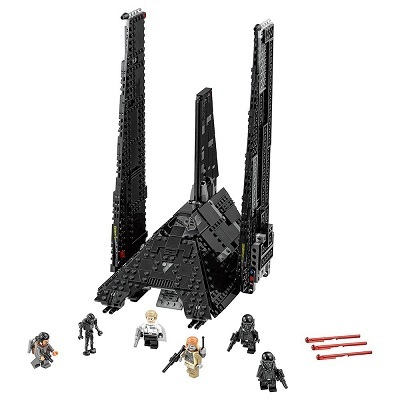 The Star Wars Krennic’s Imperial Shuttle building set brings all of the heart-pounding action of the prequel movie Rogue One right to your living room. 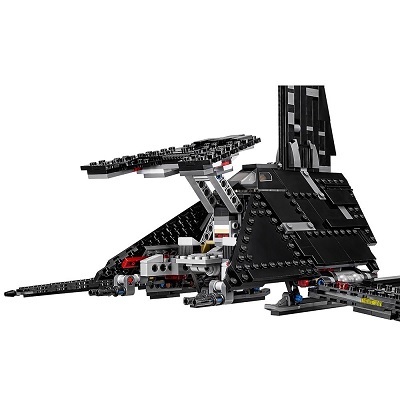 This massive armor-plated shuttle is reminiscent of the battleship Darth Vader used in the original trilogies and has become a favorite to both old and new fans of the series. Tons of minifigures give you the freedom to recreate scenes and even make up your own with this highly interactive LEGO model! The folding wings of this Imperial Shuttle allow you to place the ship in both flight and landing modes, perfectly positioned to match its movie appearance. 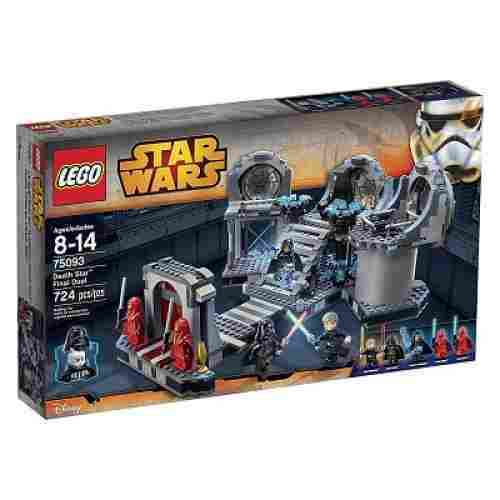 A ramp extends from the back of the ship with storage for all of your minifigures and their blasters inside. Landing skids can be extended for landing and retracted for flight, providing even more realistic play. Each side of the ship is also fitted with a spring-loaded shooter for dual-firing action! It’s great for encouraging your kid to rewrite the story the way he or she see fits. It’s also great for enhancing manual dexterity. 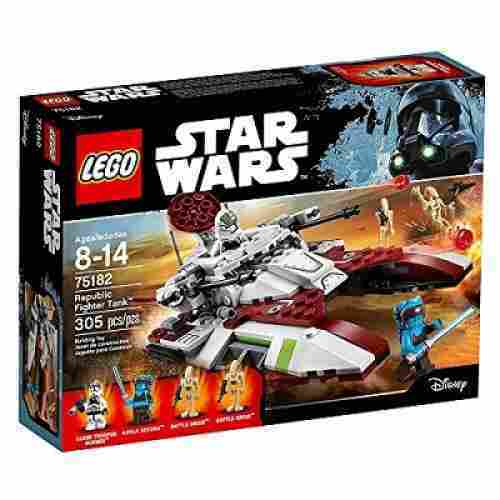 It doesn’t get much better than this as far as LEGO sets go and as your child plays, they’ll love finding all of the hidden features around the set that will help them act out the fight of a lifetime. This set is a completely realistic replica, even down to the weapons that each of the mini-figures carries with them. It makes for a fun family project or even a great after-school activity for kids who have friends with similar Star Wars interests. When they’re done building the Death Star, they’ll have hours of playtime, reenacting various scenes and coming up with new ways for Luke Skywalker to defeat Darth Vader and overthrow the guards. Who knows...There could always be more than one ending to Return of the Jedi! LEGOs are a hit with any kid but the real thrill of piecing them together comes when they have the chance to build the Death Star. Yes, that’s right -- The one and only from Star Wars. Not only will kids be able to build it with this complete kit but they’ll also be able to stage their own Star Wars-themed coups as well. This kit is so awesome because it comes with every character your child needs to reenact famous scenes from Return of the Jedi. 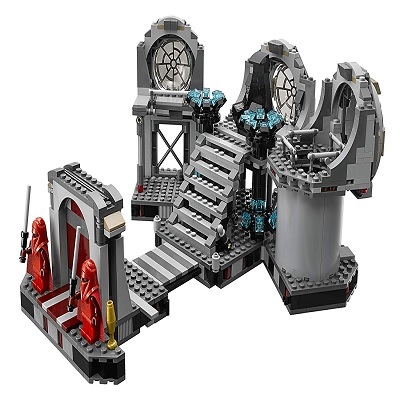 They can replay their favorite scenes from the movie or use their wild imaginative play to create their own unique scenarios with the addition of Darth Vader, Luke Skywalker, Emperor Palpatine, and the addition of two guards as well. You can’t reenact scenes from Star Wars properly without having a duel building kit by your side! 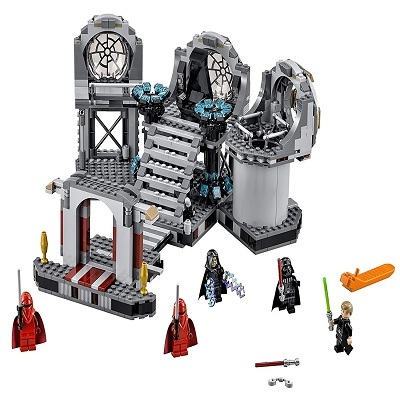 This set features all of the realistic details such as a jump function, hidden Jedi lightsabers, a rotating throne, and other major details that make this kit so true to the movie! 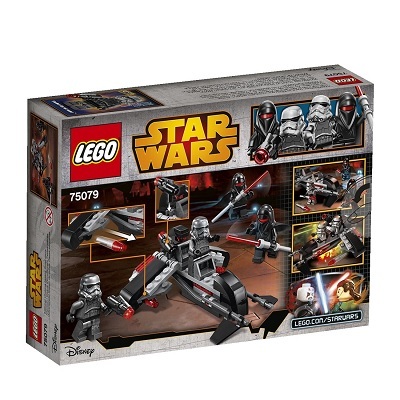 Expand your Star Wars collection with this Speeder bike set that will let you run down Rebel troublemakers in style! One of the most popular Star Wars vehicles is the Speeder. Featured several times throughout the series, this hoverbike is the epitome of cool even though it is often used primarily by the bad guys. 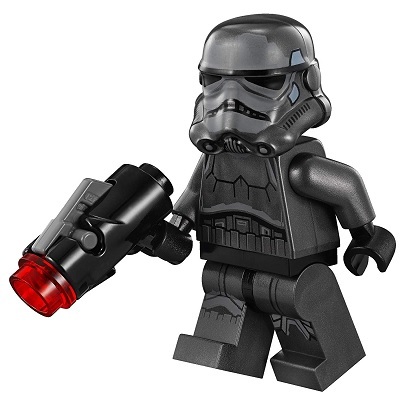 With the Lego Star Wars Shadow Trooper building set, your child can expand their Star Wars collection with one of these magnificent motorbikes. 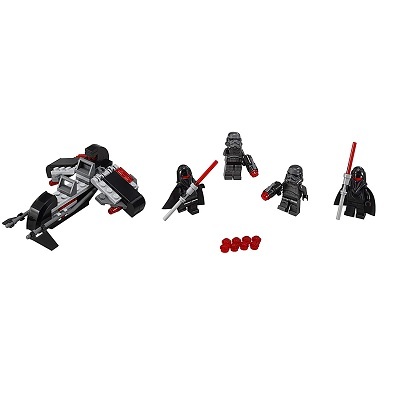 Four minifigures accompany the set featuring the Shadow Troopers from the newest Star Wars movies. The Speeder can accommodate up to two of the figures at once along with all of their gear. Take out Rebel fighters with missiles, blasters, and even lightsabers. Get ready to defend the Empire...at all costs! Clocking in at 95 total pieces, this Speeder and minifigures build kit is the perfect introductory set for younger children. The instructions and the design feature less complex instructions than some of the larger sets and is recommended for children as young as 6. Extra ammunition is included to help stave off future frustration and makes sure that your little one has all the tools they need to fight for the Dark Side. Building with LEGO’s is a perfect way to improve hand-eye coordination and stimulate creativity while having a ton of fun! 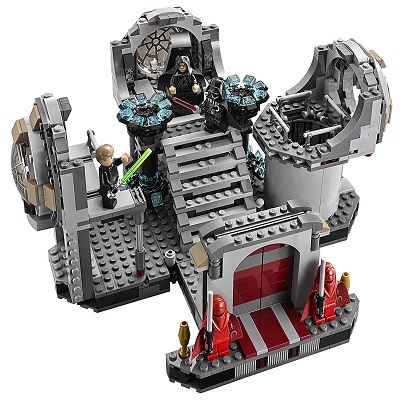 This building set is a nice, small alternative to other Star Wars kits that can be massive in size and take up a lot of space, which is not always something that kids have much of. It’ll fit well on a shelf while still providing the great Star Wars feel that fans look for in collector’s items. 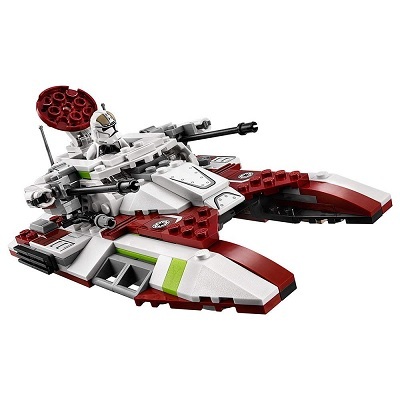 The tank itself has hidden wheels that will create a faux hover-effect just like the other LEGO sets and would be a great add-on to any existing collection. 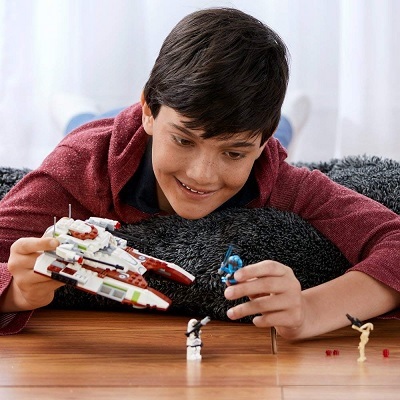 It’s perfect to help kids create their own Star Wars scenarios and encourages them to use their imaginations to put their new figurines into action with an unbeatable tank on their side. 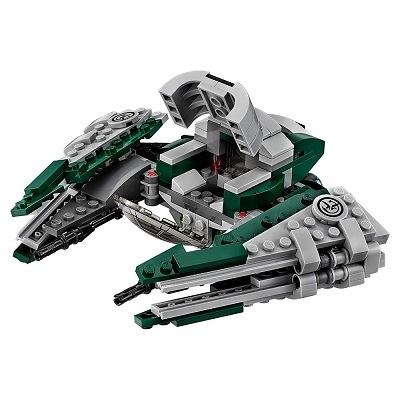 If you’re looking for something completely different and out of the ordinary as far as LEGO Star Wars sets go, look no further than the Star Wars Republic Fighter Tank. 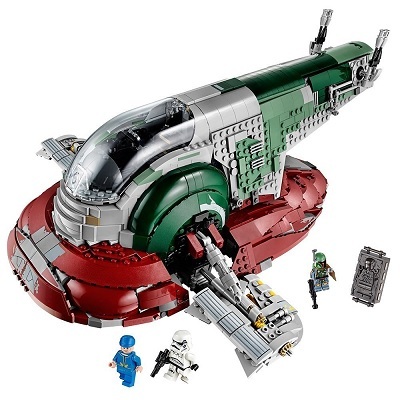 It’s a nice alternative to the other sets that offer airships and fighter ships only, and this one also includes featured figurines from the movies. The tank has rotating missile arms that add a wartime flair to this tank, as well as stud-shooters that actually launch when your child aims them. 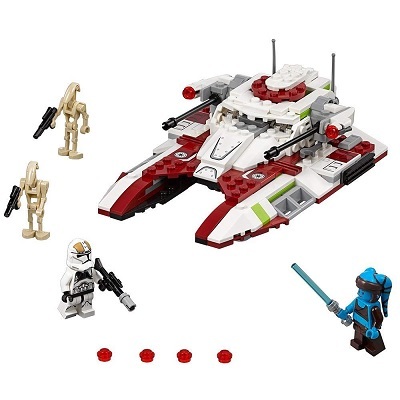 The playable LEGO figurines are Aayla Secura, one Clone Trooper Gunner, and an additional two Battle Droids to complete the battle force. The unique design of this tank makes it fairly easy to assemble and great for kids aged eight and up. It’s not as bulky or large as some of the other fighter airships so it saves on space as well as being easy to put together. 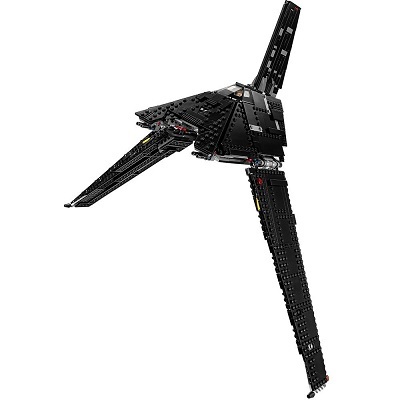 The wings that really fold and the missiles on its wingtips can help stimulate children’s imagination as they try to role play the exploits of Poe as they fight their way through the blockade of the First Order. This should be helpful in the enhancement of their cognitive abilities. 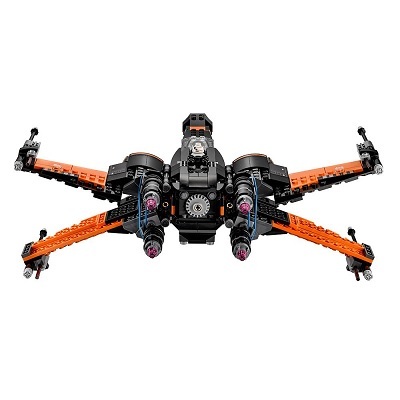 A modified version of the classic Rebel Alliance X-Wing fighter and purposely designed and built for the Resistance’s top ace space fighter pilot, Poe Dameron, the signature orange on black design of Poe’s X-Wing will surely bring out the ace in any kid. 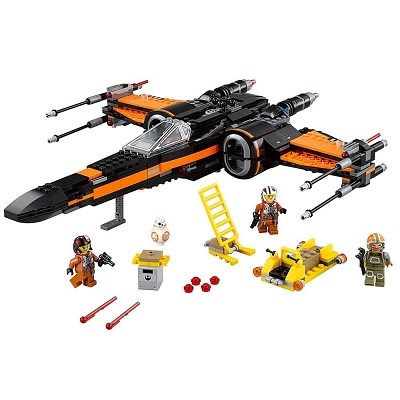 This 717-piece set comes complete with a mini figure of Poe Dameron, his loyal droid BB-8, another X-Wing fighter pilot on standby, and a ground crew of the Resistance. Make no mistake, this space fighter can shoot down any TIE Fighter in the sky. Not even the famed TIE Advanced Prototype is no match to the Poe-helmed X-Wing. This super fast ship will have your child filled with excitement and wonder once they’ve completed and built it! 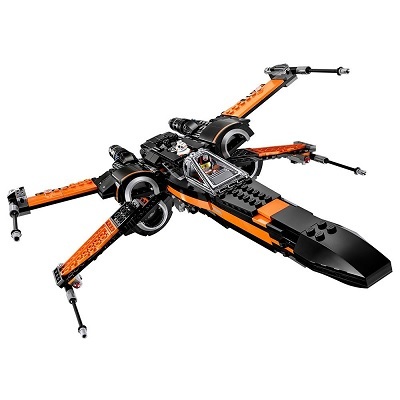 The X-Wing fighter promotes healthy imaginative play for kids whether they’re pretending they’re apart of the series or making up their own scenarios altogether. An iconic vessel from the original trilogy, this model is the perfect display place but may require some extra...adhesion...to make it durable enough for play. Recreate your favorite scenes from Episode V: The Empire Strikes Back with this highly detailed model! 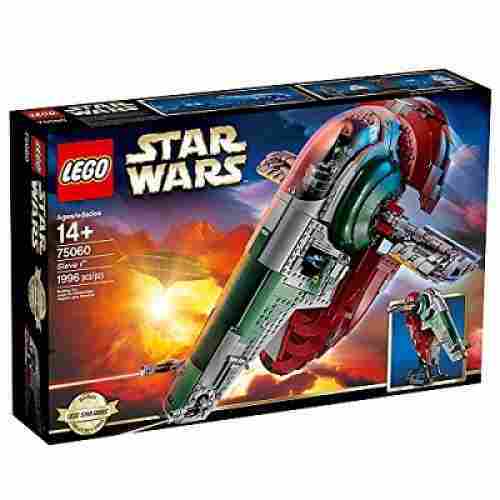 The Slave 1 makes a beautiful display ship for collectors, measuring in at over 17 inches long. Tons of interactive functions like the rotating cockpit and dual missile launchers can provide hours and creative play for old and new fans alike! Boba Fett has captured Han Solo and delivered him to Jabba! The despicable Hut entombs our hero in carbonite and now the bounty hunter must escape Bespin with him trapped in his ship’s cargo hold. 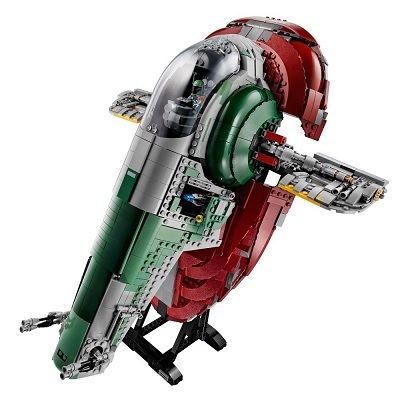 Craft Boba’s infamous ship, the Slave 1, through a complex and exciting build that incorporates almost 2,000 pieces! Expand and create your own saga in the Star Wars universe with this massive building set. Famous and infamous characters alike make an appearance as minifigures including the bounty hunter Boba Fett and the man who made the Kessel Run in less than 12 parsecs, Han Solo. Hidden weapons caches and cargo holds provide all the storage space that a young smuggler needs. 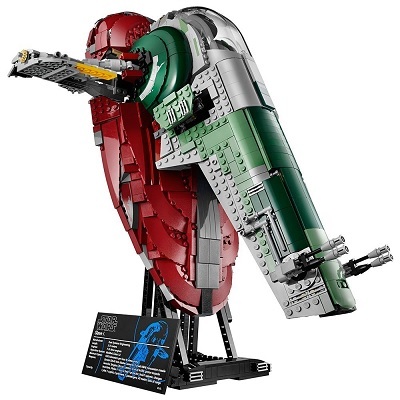 This set also includes a sturdy display stand to showcase your massive build in flight-ready poses. 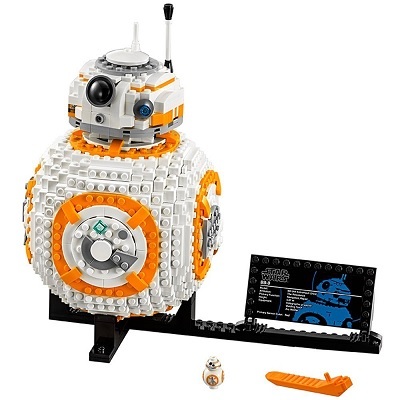 In 2019 Lego sets and Star Wars are no longer just for kids! An entire cultural phenomenon has built around these two mainstays from kids that grew up in the ’70s and ’80s to the adults that still love these forms of play as a hobby and now their kids, and eventually grandkids! There is the natural cognitive development of kids and their motor skills, then there’s the addition to the current cultural dialogue and meme. The research consists in that, considering that while many of these sets are good for imaginative play, they are way beyond the mechanical abilities of many children! Some older children will definitely get it! Then, there is the consideration of the aptitudes of kids of each generation as they evolve–know more and acquire deeper understanding and ability! Coming up with the top Lego Star Wars playsets is never easy and we are pretty sure you know why. As such, we had to look for other ways to determine the best. Unfortunately, if it’s from Lego there’s no question about the quality as well as the developmental appropriateness of the building and construction sets. There is also no question about the safety of the products. What we are left with is the feedback and reviews from parents and other customers who have already bought the product. We had to carefully look at what others are saying and whether they would recommend such model to a friend. Choosing was never easy but we did it anyway. One of the most developmentally beneficial playthings kids can ever have are building and construction toys. And when it comes to such toys, Lego is always on people’s minds. Although it is not the only toy manufacturer that provides such types of game materials, it is nonetheless become the benchmark for all other companies that design and manufacture such toys. But just how valuable are these playthings anyway? For starters, building and construction playsets are important in the development of children’s physical skills particularly their fine-motor skills, visual-motor coordination, and balance. They are able to exercise the fine muscles of their hands and fingers which can lay the foundation for the development and mastery of their handwriting, drawing, and painting skills as well as other activities that are dependent on manual dexterity. As far as self-esteem goes, the ability to complete a Lego Star Wars project without any aid from mom or dad can really boost the child’s confidence. It gives children a sense of accomplishment. They know that even though they are still kids, they now have the ability to create and build something just using their hands and their imagination. Now how you would feel if you were this kid? Wouldn’t you feel proud and great of yourself as well? Construction playsets are also important in the development of children’s cognitive abilities. Given a variety of shapes and colors, young children are able to discern and gain mastery of these different attributes of building bricks and blocks. The textured nature of the bricks can also provide additional sensory information for the brain to process. For example, a 1×4 brick will feel a bit more different from a 4×8 block simply because of the greater number of protrusions or block heads. When touched by children, they feel the difference and this helps them develop their discerning abilities. Moreover, playing with building sets can also help children develop and harness their problem-solving skills, primarily their divergent thinking. When given several blocks, they use a lot of their cognitive processes to determine what other models can be built. Some may refer to this as the child’s creativity and imagination but it’s all about problem-solving. It’s all about finding out how to piece the different blocks in different configurations to create something new. They try to find out which building block or brick will best fit into a particular arrangement to get the desired outcome. Another aspect of your child’s cognitive development that will benefit immensely from Lego toys is his or her language development. Just imagine a child adding lightsaber, Jedi, knights, empire, dark, good, evil, and first order in his or her vocabulary. With a widened vocabulary, children can better communicate what they have in mind. They can converse well even with adults. And this can help boost their self-confidence and, consequently, their self-esteem. This helps build their social skills even more. 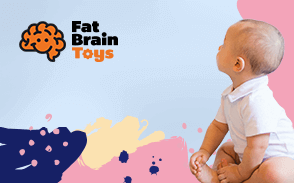 So, these toys actually help develop kids’ emotional and social competence. q: How detailed are the instructions on these sets? Of course Lego strives to give the most detailed instructions possible! The whole point is that you have a positive experience, that these sets remain within the possibility of achievement and completion, and are doable! One can also get help from the picture on the box, as well, to get a sense of the finished product. There are certain limiting factors that are indicated by age range. Most importantly, most Lego projects are exercises in patience! The emotional maturity of a young child could easily get overwhelmed by an 1,000+ piece set! In most cases, for any other additional instruction that might be missing from the manual, can easily be found online. q: How true are some of these replica sets to the originals in the movie? q: Will any of these have future value? For sure! It has already been shown that the products from Star Wars for the last 40 years have been fetching a fairly pretty penny as collector’s editions! Not only this, but the entire hobby of creating Lego buildings and vehicles has become all-consuming within itself and in some cases a career! There are Lego building competitions all across the country, specifically for the purpose of displaying creations like the products we have for sale. With the new culture of Comic-Con to add to all of this, the value tends to go up every year now, if not every month. q: How much does this contribute to imaginative play? Star Wars is one of those archetypal stories that lingers in the subconscious of all humans. It’s the hero’s journey! The sense of imaginative play that comes out of this is enhanced by the strong visual references that we have from the movies. Not just the movies, but a generational sense of passing this down now from parent to child. As the technology for movie making becomes more sophisticated, the realms definitely get blurred and the imagination deepens in a way that once the child comes to our products, the die has already been cast for a deep, enjoyable and engaging experience! q: Can I buy additional Lego Minifigures without buying an entire set? In the past, this would’ve been impossible! And, in fact, many people do still buy entire sets for the extra figures! Now, you can easily go to the Lego store and find what you’re looking for! Pretty much anywhere on the web you will be able to get some extra figures! Or, simply contact the seller through your order or contact Lego directly concerning the product in question to ask about an extra figure and inquire if there’s a serial number that can be used in reference for it in the future! q: Is there a warranty on any of these sets? There doesn’t seem to be a warranty to speak of! Lego tends to stand by it’s reputation of solidity! Their website and customer service are more than accommodating for any kind of issue you may have. It offers replacement parts, extra figures, extra accessories. There are even online instructions on how to add to already-existing sets! The number of options out there and superb customer service more than compensate for there being any sort of lack of warranty on the part of Lego.